These nights are a fantastic way to engage with your own family, get to know other families, and learn a great truth from God’s Word. 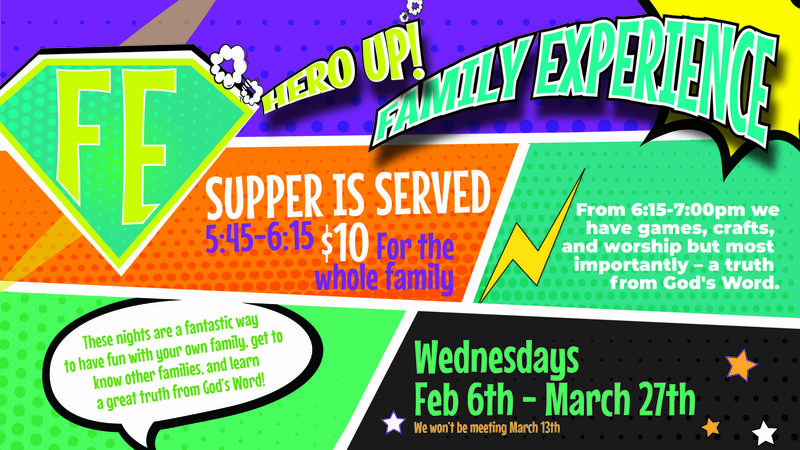 Our family nights happen every Wednesday from February 6 – March 27 (except March 13). Dinner goes from 5:45-6:15 and costs $10 dollars per family but free for you and your guest if it’s their first time. From 6:15-7:00 is all the fun you can imagine! Our Family Experience is geared for school aged kids (K-5th grade) BUT if you have kids who are younger we’d love to have you, too! Middle School students meet downstairs from 6:00-7:20.